Jasper Mt. Road takes off SR12 between Waitsburg and Dixie on McCown Rd - you cross Coppei Creek and go straight - if you turn right you go to N & S Forks Coppei Creek. Green-tailed Towhees are now found on North Fork Coppei Creek Road - as soon as you come to the top - anywhere there are brushy hillsides downslope - with patience and very little playback they will come out. If you use too much playback they will hide and not come out. Encompassed by the Umatilla National Forest, the Blue Mountains rise abruptly to the east of Walla Walla, peaking above 6,000 feet. Precipitation increases dramatically as you ascend the western slopes; mountain streams cascade down to the Walla Walla and Tucannon River basins. Erosional forces have produced steep-sided canyons and rocky escarpments, home to raptors and other birds of the cliffs. At lower elevations, wheat- and rangelands reach up to the lower forest zone. Lush riparian growth along the drainages is filled with birds in spring and early summer. At middle elevations, brushy patches clinging to steep valley sides host Washington’s only breeding Green-tailed Towhees. A mosaic of forest communities (low, high, wet, dry) ranges from Ponderosa Pine, Douglas-fir, and Grand Fir up to Subalpine Fir, Engelmann Spruce, and Western Larch, with bird species appropriate to these habitat types. Some call the Blue Mountains Washington’s Woodpecker Heaven; as more and more birders are discovering, the same might be said for owls. Elk, Mule Deer, Bighorn Sheep, and Black Bear are also common. A good strategy to bird the Blues is to begin at low elevations in the morning and work to higher, forested habitats toward mid-day. Or, during periods of inclement weather (which can be frequent in the high mountains), one might be advised to take refuge low down all day. Birding is best from mid-June to early October, after which the higher roads begin to drift over with snow. 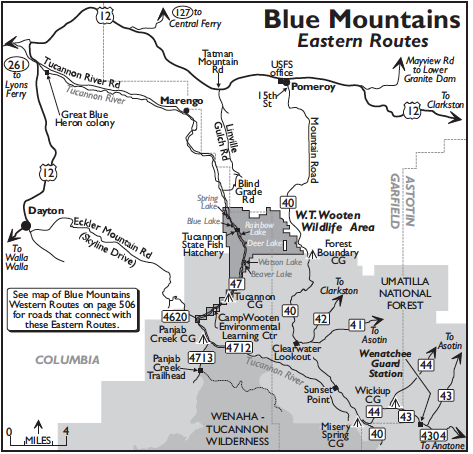 US-12 traces the western and northern base of the Blue Mountains on its way from Walla Walla to Clarkston, passing through Dixie, Waitsburg, Dayton, and Pomeroy—well-preserved towns established in the 1870s on lumbering, wheat farming, and supplying Idaho-bound miners. 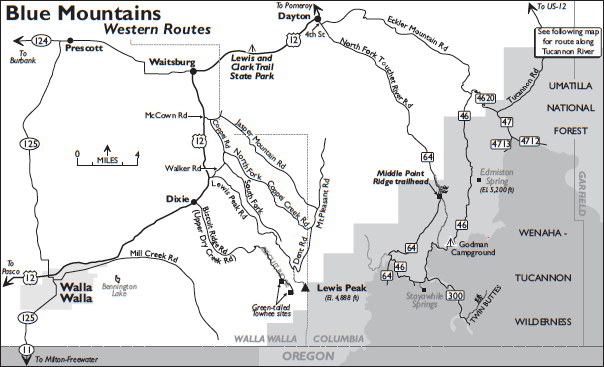 The core of the high Washington Blues is set aside in the roadless Wenaha-Tucannon Wilderness Area (177,469 acres, partly in Oregon). Access by road is thus mostly an in-and-out affair from US-12 along various ridgelines and drainages. An exception is the up-and-over route via the Wenatchee Guard Station, providing an excellent connection between Pomeroy and the canyonlands east of the mountains. To look for Green-tailed Towhee, head east on US-12 from Walla Walla eight miles to the town of Dixie and turn south at the school onto Biscuit Ridge Road. After 6.5 miles the road does a hairpin turn, becomes gravel and is steep, but OK for passenger cars. In another 3.7 miles, you are on a ridge along a south-facing slope. From mid-May to mid-August, in the brushy areas on the slopes for the next mile, you can usually hear the Green-tailed Towhees, with a little patience. This is all private property, so you want to stay on or near the road. In May and June especially, the paved section of this road is very birdy. Pacific-slope Flycatchers are abundant along here, nesting in the banks and cliffs along the creek. Veery, MacGillivray’s Warbler, Fox Sparrow, Western Tanager, and Lazuli Bunting are also abundant. Back on US-12, head north two miles from the Biscuit Ridge Road turnoff to Lewis Peak Road. It’s passable to the top (elevation 4,888 feet) except in winter, when you can walk up to look for Northern Goshawk, Pine Grosbeak, crossbills, and Common Redpolls. Again, this land is all private property, but there are pullouts; birding can be rewarding here any time of year. To reach Coppei (pronounced COP-eye) Creek, after you exit US-12 onto Lewis Peak Road, veer left at the fork in 0.2 mile onto Walker Road. Go up over Walker Hill, then down to a T-intersection. You can park here and walk either direction or drive up six miles south along South Fork Coppei Creek Road. All the riparian areas along Coppei Creek are passerine heaven from late April through mid-July and again in August–September during migration. Willow Flycatcher, Veery, Gray Catbird, Yellow-breasted Chat, and Lazuli Bunting are common. Least Flycatcher has nested up South Fork Road. High-mountain bird species may be present in winter. From the intersection, go left (downstream), cross the two forks of the creek, and turn right to North Fork Coppei Creek Road. In 3.2 miles you will come to a steep grade. Park and walk uphill along this birdy area. Indigo Bunting was found over halfway to the top in 2008. MacGillivray’s Warblers and Lazuli Buntings are abundant; Dusky Flycatcher, Cassin’s Vireo, and Pacific Wren are found in lesser numbers. Northern Pygmy-Owl is present year round. Or you can backtrack on North Fork Coppei Creek Road to the point where you earlier crossed the two forks of the creek. Instead of turning left across the creeks, continue straight ahead onto Coppei Road, which intersects with McCown in 2.5 miles. Take a left onto McCown and go a half-mile to US-12. Once you are back on US-12, continue north 3.3 miles into Waitsburg, where the highway makes a right-angle turn to the east. Lewis and Clark Trail State Park (campground) is 4.4 miles farther east on US-12. Many birds inhabit the dense riparian woodland along the Touchet River here, including Western Screech-Owl, Eastern Kingbird, Warbling and Red-eyed (uncommon) Vireos, Black-billed Magpie, Veery, Gray Catbird, Yellow Warbler, Yellow-breasted Chat, Black-headed Grosbeak, and Bullock’s Oriole. An excellent loop into the high Blue Mountains follows a ridgeline south from Dayton above the North Fork Touchet River, returning via the river valley. Turn right onto Fourth Street in Dayton (5.5 miles from Lewis and Clark Trail State Park), then left in 0.5 mile onto Eckler Mountain Road (aka Mustard Street, Mustard Hollow Road, and Kendall Skyline Road). Follow this road (summer only) for about 16 miles to an intersection on the left with FR-4620 (connects in about four miles to Tucannon Road). Keep on Eckler Mountain Road, which becomes FR-46 upon entering the Umatilla National Forest in another 0.8 mile. Edmiston Spring (6.0 miles, elevation 5,200 feet) offers a fine sample of the higher-elevation birdlife (Wild Turkey, Williamson’s Sapsucker, Ruby-crowned Kinglet). Another 5.1 miles uphill is Godman Campground, on the high Blue Mountain divide (north slope draining to the Touchet River, south slope to the Wenaha River in Oregon). These forests of Subalpine Fir and Western Larch are inhabited by Northern Goshawk and by Williamson’s Sapsucker and other woodpeckers, including American Three-toed (uncommon). Five miles farther, FR-300 turns off left from FR-46, leading in about six miles to the trailhead for the short hike to Twin Buttes. These high-altitude forests should be checked in September and October for Boreal Owl. Return to FR-46 and turn left. The road snakes along the ridgetop, mostly in subalpine forest (good for Boreal Owl). In about two-thirds of a mile park at the trailhead on the left and make the short hike to Stayawhile Springs. Flammulated Owls have been noted in the dense, long, narrow stand of trees and woody shrubs to the west and south of this spot; forests to the east and north are prime habitat for Boreal Owl. At the junction with FR-64 (5.1 miles from FR-300), turn right and head down the North Fork Touchet River. In 6.9 miles, park at the Middle Point Ridge Trailhead. Cross the rushing stream on a footbridge. As you walk downstream on the trail through old-growth forest of Grand Fir, Engelmann Spruce, and Western Larch, with abundant Western Yew in the understory, look for Hammond’s and Pacific-slope Flycatchers, Chestnut-backed Chickadee, Pacific Wren, and Townsend’s Warbler. From the trailhead, it is about 17 miles downhill via FR-64 (becomes North Fork Touchet River Road, then Fourth Street) to US-12 in Dayton. The Tucannon River drains the large midsection of the Washington Blues northward to the Snake River. US-12 crosses the Tucannon 13 miles north of Dayton. Turn east (right) at the north end of the bridge onto Tucannon River Road and follow the beautiful Tucannon Valley, a mosaic of farms and riparian vegetation rimmed with basalt cliffs. In 1.1 miles look toward the river for the large Great Blue Heron colony in the Black Cottonwoods. Also watch for Spotted Sandpiper, Belted Kingfisher, and Eastern Kingbird in summer. In the fields, watch for Wild Turkey and White-tailed Deer early in the morning or in the evening. Good bets on the way to tiny Marengo (10 miles from the heronry viewpoint) include many Red-tailed Hawks (nesting on the cliffs north of the road, especially along the first few miles), Chukar, Great Horned and Short-eared Owls, Common Nighthawk, and Rock Wren. Ferruginous Hawk is also possible. Beyond Marengo the road bends to run more or less south. After entering the William T. Wooten Wildlife Area (11,778 acres), you reach the first of five artificial impoundments at Spring Lake (10.1 miles). This is a rugged area of valleys and ridges with conifers and brush on the high, steep slopes. Look for Red-naped Sapsucker, Red-eyed Vireo, and Gray Catbird in streamside vegetation on the valley floor. Park at the Tucannon State Fish Hatchery (1.0 mile) and walk south to Rainbow Lake, watching for Pacific-slope Flycatchers, Cassin’s and Red-eyed Vireos, Gray Catbirds, and huge numbers of butterflies in spring. In August and early September, Solitary Sandpipers (as many as eight at once) occur at the hatchery ponds and Rainbow Lake. Continuing south, the road soon enters the Umatilla National Forest and becomes FR-47. Camp Wooten Environmental Learning Center (6.1 miles from the hatchery) is good for most of the middle-elevation birds of the Blue Mountains. Northern Pygmy-, Barred, and Northern Saw-whet Owls are present in March and April; in summer, Flammulated Owl can be found an-other 1.3 miles south on FR-47. Watch for woodpeckers and American Dipper along this portion of the river. In another 0.7 mile (2.0 miles from Camp Wooten), you will come to FR-4620, on the right, which connects to the North Fork Touchet River loop (page 506). Continuing south on FR-47, Panjab Creek Campground is reached in 1.8 miles (USFS, primitive, fee). The road divides here; take the right fork (FR-4713) to the Panjab Creek Trailhead (3.0 miles). This trail traverses a superb example of a moist Eastside forest (elevation about 4,000 feet). Look for Northern Goshawk, Pileated Woodpecker, Chestnut-backed Chickadee, Hermit and Varied Thrushes, and Western Tanager. As you return to US-12, ff you will next be heading east on US-12 toward Pomeroy, a shortcut (weather permitting) can be made by turning right from Tucannon Road onto Blind Grade Road, 2.0 miles downstream (north) from Spring Lake. This appropriately-named gravel road switchbacks steeply up to a four-way junction (2.4 miles). From here, take the paved Linville Gulch Road (becomes Tatman Mountain Road) for 6.5 miles down to US-12. Turn right to reach Pomeroy in about five miles. Wenatchee Guard Station, on the crest of the Washington Blues at an elevation of about 5,200 feet, may be approached either from the north (US-12 at Pomeroy) or from the east (SR-129 at Anatone). Time and other considerations allowing, the 40-mile drive between these two towns—over the top and down again, in either direction—is a perfect way to experience the birds of this remote corner of Washington. Breathtaking vistas of deep gorges and into three states are an added inducement. On the east side of Pomeroy, turn south from US-12 onto 15th Street. (You can obtain maps, road and trail information, and a Northwest Forest or America the Beautiful Pass at the USFS ranger district office on US-12 a mile west of this corner.) At 7.8 miles south of US-12, you reach an intersection, with SR-128 splitting off to the left; continue straight ahead onto Mountain Road, which eventually becomes FR-40. In another 7.4 miles, you reach Forest Boundary Campground, just within the national forest boundary. Ponderosa Pine dominates; look for White-headed Woodpecker, Pygmy Nuthatch, Yellow-rumped Warbler, and Cassin’s Finch. In another 7.9 miles south, at Clearwater Lookout, you enter the eastern Blue Mountains. From this point forward, the slopes to the left of the road drain to Asotin Creek, which reaches the Snake River at Asotin. Sunset Point (4.0 miles) affords spectacular views of the upper Tucannon Basin on the south side of the road. Although this is not officially designated wilderness, no sign of humankind is visible below—a rare experience nowadays. In another 3.7 miles is the turnoff to Misery Spring Campground. Here, at 6,200 feet, the trees are Subalpine Fir, Engelmann Spruce, and Western Larch. Ruby-crowned Kinglets are abundant. Look also for American Three-toed Woodpecker, Gray Jay, Pacific Wren, Townsend’s Warbler, and Fox and White-crowned (oriantha) Sparrows. The road forks; go left on FR-44 to Wickiup Campground (3.2 miles). These high forests have been good for Northern Goshawk, Dusky Grouse, and Williamson’s Sapsucker. The road forks again by the campground; stay right with FR-43 and enjoy the dramatic vistas on your way to Wenatchee Guard Station (3.2 miles). You are at the crest of the Blue Mountains, a broad anticlinal arch (inverted U) of Columbia Plateau basalts. South from this vantage the terrain has been deeply incised by stream erosion, to the point that virtually none of the original plateau remains. Some of the northernmost Mountain Mahogany, a gnarled and grayish-hued small tree, clings to these rocky, south-facing ridges. Cool, moist forests blanket the north slopes, which have yet to be chewed away by erosion. Green-tailed Towhee was first documented as a breeder in Washington in a canyon near the guard station in 1923. Since then, however, records from this area have been few. If you’re in an exploratory mood, try hiking about the south-facing slopes, checking shrub patches. To join the Grande Ronde country, continue east on FR-43 along the ridgeline, then stay right onto FR-4304 at a fork in 0.6 mile. (Switch to map on page 510.) In another 6.9 miles the road changes name to West Mountain Road as you leave the Umatilla National Forest. In 5.6 miles, merge right onto Mill Road, reaching SR-129 in Anatone in 1.8 miles. Turn right here for Fields Spring State Park (page 514).